Mila’s going to be a mommy! 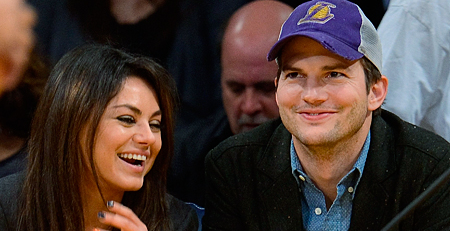 Mila Kunis is expecting her first child with fiance Ashton Kutcher, multiple sources confirm to Us Weekly. Kunis’ pregnancy news comes nearly one month after a source confirmed on Feb. 27 that the Jupiter Ascending actress was engaged to Kutcher. The former That ’70s Show costars and longtime friends first went public with their relationship in spring 2011. Another source says Kutcher is “very happy” with the news of his fiancee’s pregnancy, although he still remains resolutely private about his personal life. “Ashton has been very private and cut off more than he usually is,” the insider tells Us. But, the Two and a Half Men star has been chatting with a longtime pal who is newly-familiar with fatherhood. Kutcher, who was once married to Demi Moore, finalized his divorce from the Margin Call star last November. He shares no children with Moore, although Kutcher did grow close to the 51-year-old star’s three daughters during their marriage. “I know they are planning on being as quiet about their life together as possible,” the insider adds of Kutcher and Kunis.